Under cabinet kitchen lighting is a great choice when it comes to illuminating your kitchen because not only is it great for safety purposes (nobody wants to be using knives on a dimly lit work surface) it also creates a subtle, soft glow which creates an amazing kitchen atmosphere, perfect for romantic dinner dates. This additional lighting is easy to stick under cabinets and really adds another dimension to your kitchen space, making it appear bigger – definitely worth considering if your kitchen feels a little cramped or is in need of a little TLC! If you are considering porch lighting or illuminating your garden, have you thought about subtle but effective strip lighting that will brighten your garden as the cold, dark nights draw in? They are so cheap to run and really easy to install but also have effective illumination. If you want to highlight a water feature or line your lovely paved garden path then these are ideal because they can bend in different directions and when lit up truly do have a magical effect on your outside space. If you have a mirror that requires a bit of extra lighting, such as a mirror on your dressing/make up table or a mirror attached to your wardrobe, or even just a plain mirror that you feel needs brightening up, you can use LED strip lights. Feel like a movie star staring into an illuminated mirror but due to the subtle LED glow the light wont reflect off the mirrors surface – a cheap and easy fix to make you feel a million dollars (and actually notice when your make up’s patchy). Bulb in your fridge gone and you can’t afford to get it fixed? Fridge bulbs are often expensive to replace and so a great alternative is to use LED strip lighting – you can also get fun colours to make things a little more interesting! The strip lights are extremely energy efficient and cost next to nothing to run. What’s more, they have a power time of approximately 30, 000 hours so no more burst bulbs! LED strip lights can basically be used pretty much anywhere and they can have a fun and futuristic feel when used in the right places! 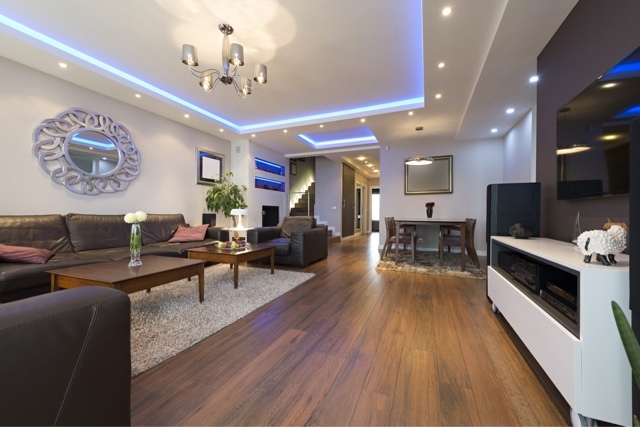 Sticking colour LED strip lights underneath your furniture means that your furniture is illuminated when the main lights are turned off. This might just be a bit of fun but if the contemporary look is something you’re after in your home – this can be a great way of achieving it.